Material: Containers with different types of lids (pots, plastic or glass bottles, cans, tins and tubes). 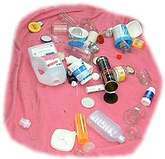 There are 20-30 different containers (bottles, lasses, tins, pots, tubes etc.) with different lids placed on a table or blanket. All of the lids must be matched up with the relevant containers with 1 minute (2 minutes). The number of correctly placed lids are counted up. There is a half a point (or whole point) per correct lid.